Through utilising a Bobcat machine Tripod Crest have used less material and achieved a higher quality result. In turn, the road lasts longer and ultimately delivers whole life value. 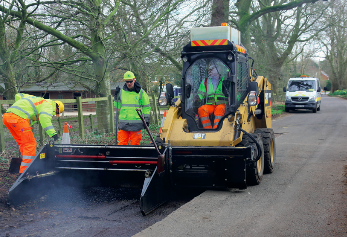 Tripod Crest has invested in a modern method of efficiently undertaking carriageway patching repairs. 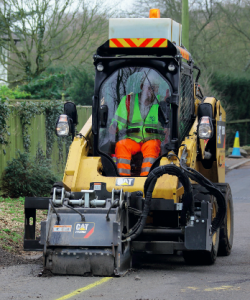 This process utilises a Bobcat machine that is equipped with planing, sweeping and asphalt laying attachments; in addition to the traditional front-loading shovel. Asphalt is collected and stored within hot-boxes and discharged into the asphalt paver loading hopper where it is placed and compacted to a high quality standard and in accordance with the specification. 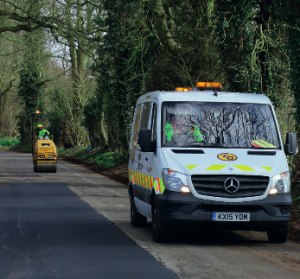 The benefits include the use of less material and a better quality result, which means the road lasts longer and ultimately delivers whole life value. The mechanical operation reduces the occupational health risks to our employees. The productivity of the operation is also increased which minimises the disruption to roadusers.